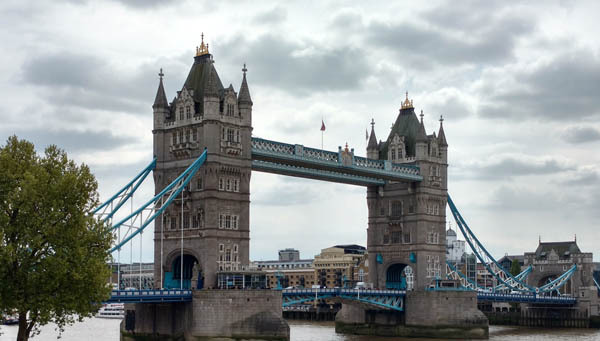 The Tower Bridge is an attraction we did not have time for, but we certainly plan to visit next time. The price for 2 adults and 2 children is £22,-. You must book a ticket at least one day in advance. You go up with the elevator in one of the pillars and then you can walk to the other side, partly over a glass floor. The engine room (with the original steam engines for raising the bridge) can also be visited. 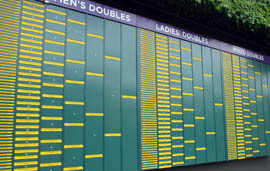 For tennis lovers there is the possibility to visit Wimbledon. 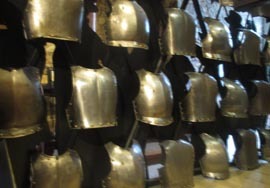 You can book a guided tour of one and a half hours, including a visit to the Wimbledon museum. The costs are £25 for an adult. One child can be brought free of charge per adult (from 5-15) and otherwise a child will still have to pay an additional £15,-. The tour was of course in English, with some translation the children received quite a bit. Our youngest child from the age of 6, we gave a camera and he has fun with it. 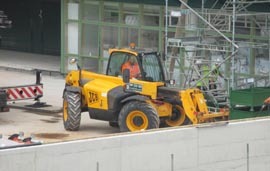 Photos from unexpected corners or other things that interest him (such as the excavator below. At that moment they were building the roof of no. 1 Court). We found the tour interesting and it was given by an enthusiastic tour guide (but you are not allowed to walk on the gras). The museum was interesting, with a VR experience and a few other interactive items. The VR was said not to be for small children, but can decide this for yourself. Do not forget to go to Hamleys with the children. The best thing about this multi-storey toy store is that toy demonstrations are given. Shop staff that plays with the toys! The disadvantage is of course that you almost can't get your children away from the store. 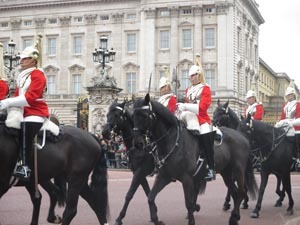 If you really want to see the changing of the guard at Buckingham Palace you have to be very early so that you can stand at the entrance gate of the palace. Otherwise you only see the guards marching or riding a few times (on horseback). 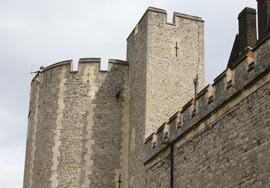 You can also go a little further from the palace along the route where it is less crowded, so that the view of the guards is better. What happens behind the palace gates can not be seen by most people. The Regimental Band plays music: marches but also more modern songs. We were not on time for a spot near the fence (just like a few thousand other people). 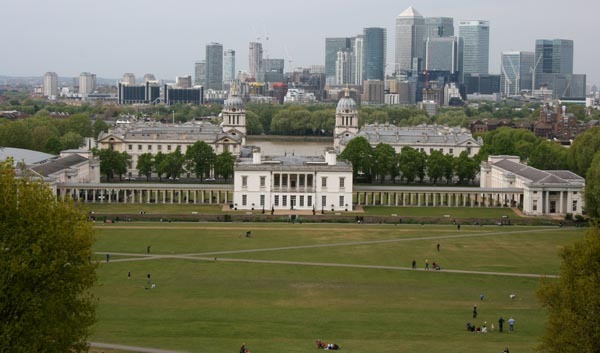 In Greenwich not only the prime meridian can be found at the Royal Observatory, but also the National Maritime Museum and the Old Royal Naval College. These 3 buildings are partially free to visit, but you have to pay for special exhibitions. At the square of the Royal Observatory you can see the prime meridian where photos can be taken (with a foot in the east and a foot in the west). However, this section is only for paying visitors. The prime meridian can also be viewed just a bit further, at the side of the valley of the Royal Observatory. The Cutty Sark, a clipper from 1869 can also be visited here (not free). From the Greenwich Park you have a beautiful view over the skyscrapers of Canary Wharf. You can also find tame squirrels in this park. They liked the peanuts that we brought with us. We have combined a day in Greenwich with the Emirates Airline cable car. You can easily reach both Greenwich and the Emirates Airline cable car by Dockland Light Railway (you can sit here at the front of the train for a nice view, a operator is no longer present). Click here for all you can do/see in Greenwich. 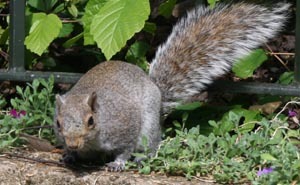 In Hyde Park, St.James Park, Greenwich Park (and other parks) gray squirrels can be found. These squirrels are tamer than the red squirrels that can be found in the Netherlands. The squirrels even dared to eat peanuts from the hands of our children! A playground can be found in both Hyde Park and St. James Park. Always nice to watch street artists. 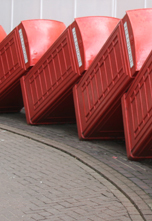 You can find them for example at Travalgar Square and Covent Garden. A very affordable alternative to expensive hop-on hop-off buses is a regular bus ride with your Oyster Card/Travelcard. With a little luck you can sit at the front for the best view! Click here for interesting bus routes. Of course there are plenty of other attractions, see also the other links on this site. By clicking on "Agree" you give With Kids permission to store and process cookies in accordance with our privacy and cookie statement.